***OBSOLETE*** Gates 7350 Lawn/Special application Belt. 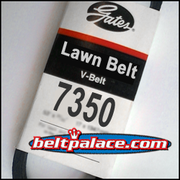 ***OBSOLETE-Contact us for the new replacement size*** Gates 7350 Lawn Belt. Belt 11A0890, Replacement belt for Lawn Equipment. Gates Special Belt 7350. Also used in UTVs, Golf Carts, and Lawn Care equipment.